All black mono panels at a fantastic price. Workmanship of the panels is guaranteed for 10 years and their efficiency for 25 years with one of the best covers on the market. German crafted high quality click fit system, one of the most advanced in the world. Also guaranteed for 10 years. See what electricity you are using and what you are producing in your home or business. The OWL is great for seeing your production from anywhere via a computer, laptop, Tablet or mobile device as long as it has an internet connection. The Wattson is good for in the home and glows different colours to tell you when you have excess electricity to use. Both devices store data of your production over the years. Canadian Solar have been in production of panels for quite some time now and have a vast amount of commercial installs under their belt. This is a great spec for the price, excellent for large solar PV commercial installs. The Fronius CL combines high-yield power electronics with the unique, modular system design of up to 15 identical power modules in the MIX™ concept. Maximum yield and the highest stability are the advantages of this sophisticated system. 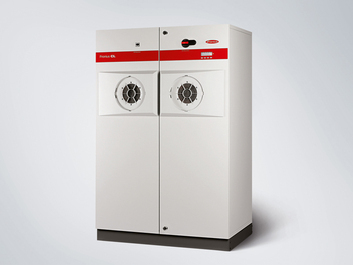 This makes the Fronius CL the optimal central inverter for PV systems of up to several hundred kilowatts. Other pluses include the exact MPP tracking of the module manager, the automatic transformer switching function and much more. This makes the Fronius CL an upscale multi-purpose device that guarantees continual high performance. Fronius Datalogger Web, which is based on Ethernet technology, offers completely new options for PV system analysis and monitoring. It functions like your own small web server that automatically converts system data into a website. The Fronius Datalogger website can be accessed by several users simultaneously via any common browser independent of the operating system. This enables you to get real time system information for up to 100 inverters in real-time whenever you want.